This project studies the role of women's writing in the transnational literary field during the long 19th century. It is explored in terms of gendered cultural encounters through reading and writing that contributed to shaping modern cultural imaginaries in Europe. The systematic scrutiny of reception data from large-scale sources (library and booksellers’catalogues, the periodical press) forms the basis for the study of women's participation in this process. By tracing and comparing the networks created through women's writing from the perspective of five countries (Norway, Finland, Slovenia, Spain, the Netherlands) located at the fringes of 19th-century Europe we question the relations between centre and periphery from a gendered point of view. The CRP thus contributes to the development of new, transnational models of writing the history of European literary culture. The use of shared digital research tools is central to the implementation and coherence of this CRP. Building on the database WomenWriters and the experience of the COST Action Women Writers In History, a Virtual Research Environment is being developed, providing not only advanced technology for statistical analysis, charting and visualisation, but also the possibility to work together in the virtual space. Parts of it will be open to the public, which will allow interested user communities to engage with our research. Outputs will include a conference, peer-reviewed articles and book publications. Enhanced online publication will directly link to the research data. These activities will be complemented by workshops and seminars organised together with our two APs, Chawton House Library (UK) and Turku City Library (Finland), sessions at international literary festivals in Norway and Slovenia inviting writers to meet their ‘foremothers’, and exhibitions in all five countries involved in the project. 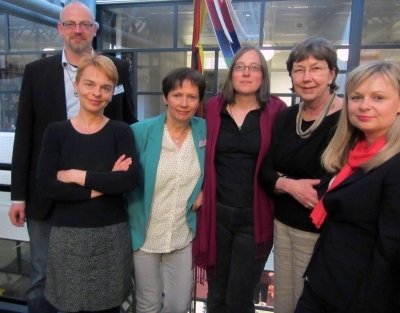 Henriette Partzsch (Project Leader), Marie Sorbo, Paivi Lappalainen, Viola Capkova, Katja Mihurko Poniz, Gertjan Filarski, Suzan van Dijk.